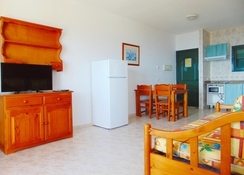 The impressive Apartamentos Cabo de Banos is located in the resort of Cala ‘n Forcat on the island of Menorca. For those who are looking for a peaceful getaway in a beachfront location then this is the perfect destination. The 3-star complex provides impressive views from the outdoor pool and sun terrace while the traditional style rooms provide a simple stay making it ideal for couples and families. The beach is just a short walk away while there is entertainment that takes place each day. 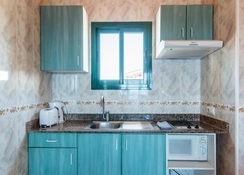 There are shops, bars and restaurants located within a few hundred metres of the Apartamentos Cabo de Bano while there are water parks and plenty of local sights to enjoy. 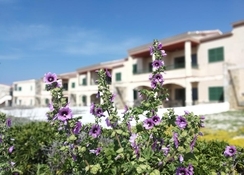 The complex is perfectly located overlooking the wonderful Mediterranean Sea and golden beach. If the views are not impressive enough then the bars, restaurants and shops located just a simple stroll away are sure to provide plenty of choice while there are many sights that guests can visit including churches and stunning beaches. There is an aqua park located nearby while the picturesque town of Ciutadella is just a short drive away. This amazing location ensures that guests are within touching distance of everything they need for a perfect holiday. The airport is 50km away from the hotel. 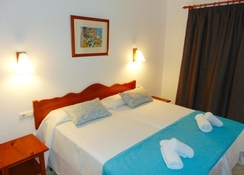 There are a total of 42 rooms at the complex with all studios offering a relaxing setting with traditional décor. Each studio has a living room with a sofa bed, a sleeping area with twin beds and a safe. There is also a TV, bathroom with Jacuzzi bath and a kitchenette. Each studio offers guests the chance to soak up the views from their balcony. If guests prefer the option of eating on-site then there is a restaurant available at the sister property as well as a bar. If guests are looking for choice then there is a great selection of restaurants and bars located nearby while they also have the ability to cook up dishes in their room. The Cabo de Banos comes with two stunning swimming pools including one for the little ones. The sun terrace is the ideal spot for soaking up the sunshine while there are views that stretch as far as the eye can see. There is a playground for children to enjoy as well as entertainment during the day and evening. If guests are looking for thrills then there are water sports and water parks in the are for them to explore.